I love posting about home decor and easy DIY. Just a little change can make a huge difference. It makes me happy! 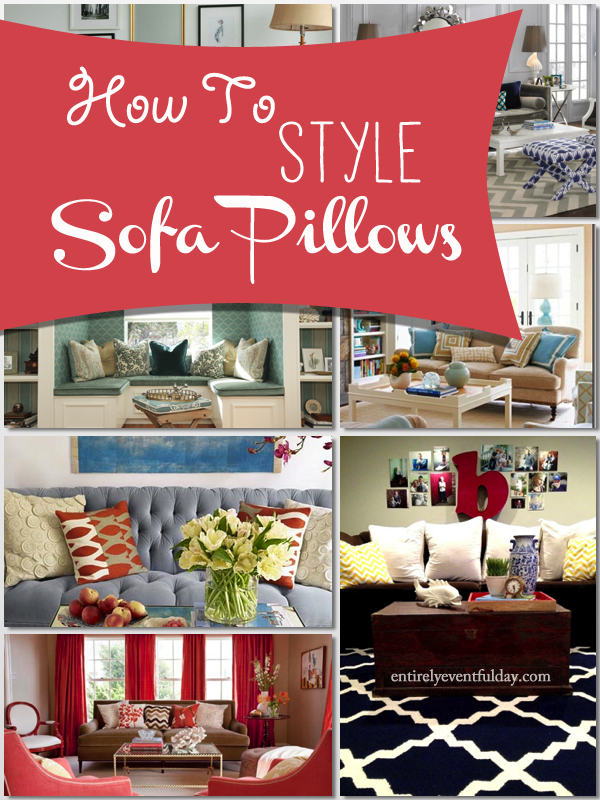 Does it seem hard to know what to do with your throw pillows? What tricks to designers use to make their sofas look so fab and put together? How can you chose just the right pillows and make them look great on your sofa? Get excited because this post is all about how to style your sofa so it looks like the photos in the magazines. Use these tips and tricks and it's actually pretty darn easy! Plus, pillows are another easy way to add color. Tip: when I shop for pillows at the store, I take up a whole isle laying out different arrangements. I then buy more than I need and try them out on my sofa. You can always take them back. This photo also shows matching pillows working inward, with an accent pillow in the center. This is probably the easiest and most conventional way to style a sofa. Tip: When mixing prints, keep the scale of the print in mind. Balance a big, bold print with a smaller, more simple print. Example, The coral print pillow above is balanced out by the smaller scale stripe. The above photo illustrates that even if you are using two sets of matching pillows with an accent in the middle, you can still get a little creative. I love how the lumbar pillow in this photo is slightly askew. The image above is from my own home. I chose plain white pillows with two matching pillows in a bold print on each end. If you want to read more about this room, you can check out my DIY Trunk Coffee Table post. Tip: Keep in mind what's going on in the rest of the room. This room is also the kid's basement playroom and there is a lot going on, so I kept the pillows simple. I love this room! This sofa uses a set of matching pillows to anchor the collection of three printed pillows. They are all very different but they work together because of the similar color story and scale of the prints. You don't have to fill the sofa with pillows! Simply a couple pairs of matching pillows placed at each end will do the trick. 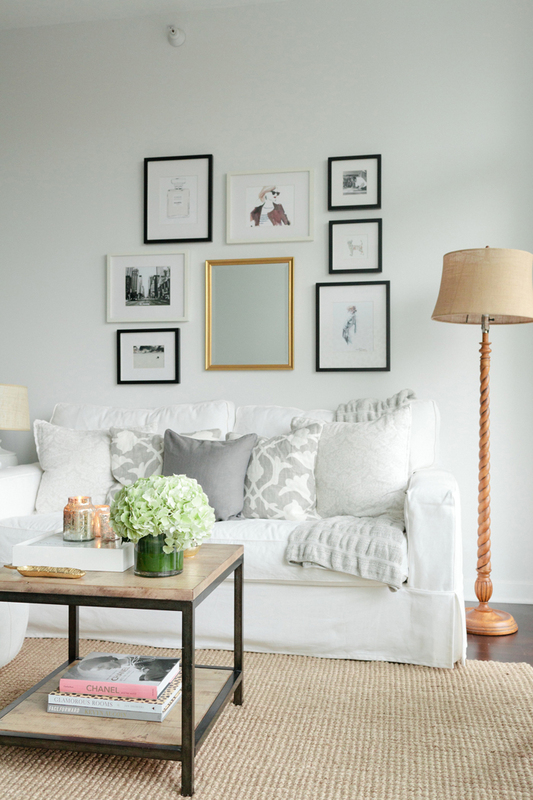 Tip: Remember, when styling your sofa, and designing a space in general, edit! What you take out is often just as important as what you leave in. Like this post? 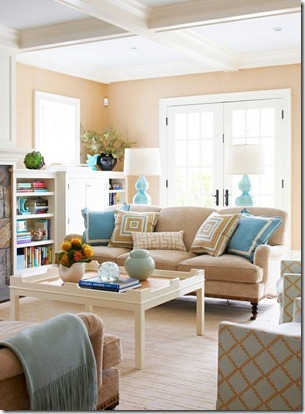 Check out How to Add Color to Your Room.